Cartoonist Rick Friday has been in the business for over 20 years, and has published more than 1,000 cartoons for Iowa’s Farm News. But, a recent “controversial” cartoon appears to have cost Friday his career. 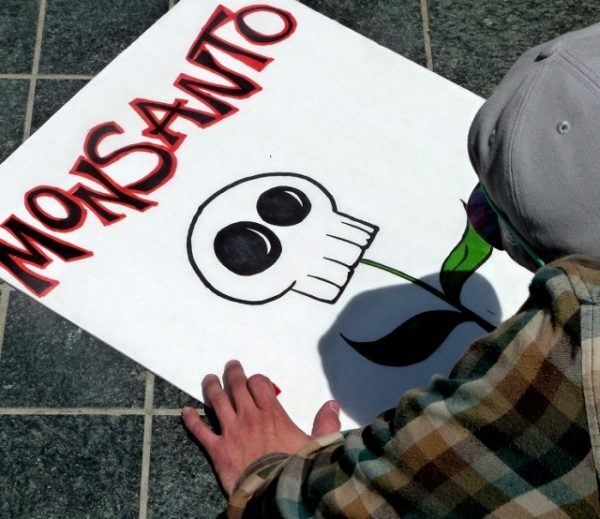 While it’s obvious that one cannot simply speak out against ruthless corporations like Monsanto without some kind of push-back, this latest event takes things one step further and gets close to blatant censorship. The cartoon features two farmers talking about farming profits. Within 24 hours of this cartoon being published, Friday reportedly received an email from the editor he worked with at Farm News, ending their relationship. According to his editor, a seed dealer even went so far as to remove its ads from Farm News because of the cartoon. Apparently, some of the paper’s other staff members also “disagreed” with the cartoon’s message. According to Friday, however, this seed dealer was one of the corporations mentioned in the cartoon, and they were “insulted” by the facts the cartoon illustrated. Is anyone surprised that corporations don’t like facts that make them look bad? After the advertisement cancellations, Friday’s editor was reprimanded, and his cartoons were put on the chopping block. In today’s world, being honest is all it takes to get you fired — especially if that honesty shows a side of a major corporation that they don’t want seen. The sad thing is that Friday was not being malicious; he was simply being truthful. As Friday explains, he did plenty of research and everything presented in the cartoon is fact, not fiction. The fact that the cartoon was 100 percent truthful and factual makes the newspaper’s choice to terminate its relationship with Friday even more confounding — but it also shows that corporate interests have infiltrated the media to a disturbing degree. Despite the ordeal, Friday doesn’t seem to hold a grudge against the news publication. Instead, he hopes that what happened to him will help others realize how delicate the balance between freedom and tyranny really is. “That’s okay, hopefully my children and my grandchildren will see that this last cartoon published by Farm News out of Fort Dodge, Iowa, will shine light on how fragile our rights to free speech and free press really are in the county,” he stated. Friday’s career with Farm News may be over, but he will not be soon forgotten. Over the course of the last 21 years, he’s created some 1,090 cartoons that made their way to over 24,000 households across 33 different Iowa counties. Friday may be on a new path now, but hopefully for him, it will be a better one. After all, who wants to work for a publisher that doesn’t believe in free speech? If the facts presented in the article were accurate, there was no reason to fire him and he did nothing wrong — except in the eyes of the corporations he took a stand against.